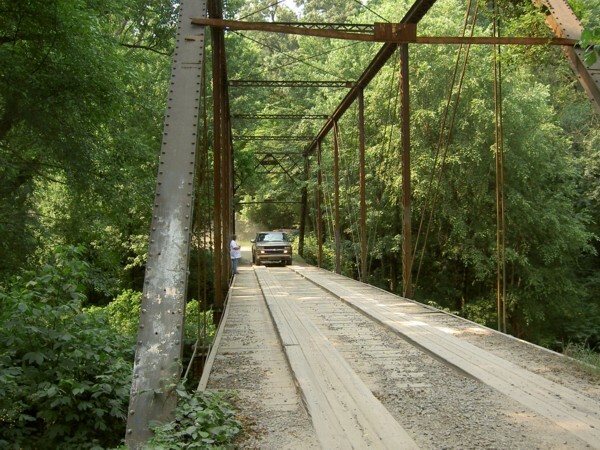 Over the past few years Conway County has replaced several of the old one-lane, wood-decked, iron suspension bridges with modern two-lane concrete spans. The first to be replaced were those on the roads most traveled which often were the oldest bridges. The new bridge would be constructed beside the old bridge and then the road would be moved over to match the new location and the old bridge was torn down. Other old bridges were washed away by floods and perhaps a few had been bypassed by progress and road re-routing. The north end of Conway County was separated from the south end by East Point Remove Creek on the east and West Point Remove Creek on the west. I was more familiar with the East Point Remove Creek crossings because SH 95, the main road from my home town to the county seat, crossed the creek at Possum Trot, the old dirt road through Lanty to Solgohachia on SH 9 crossed the creek a few miles upstream, and between them was the Fryer Bridge. A narrow dirt road left SH 95 just north of Possum Trot and follows the mountain along Fryer Bluff on the north side of East Point Remove Creek. In about a mile the road meets the creek and makes a sharp right turn across the bridge and then goes on to Solgohachia on SH 9. 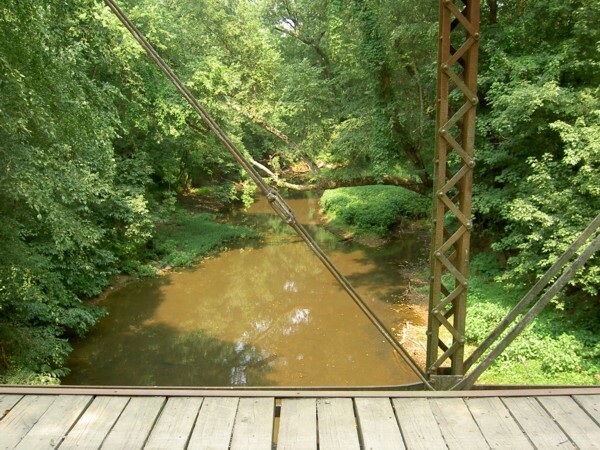 There was a good swimming hole at the bridge and the area was known as a lovers’ lane back then. The bridge on SH 95 was replaced many years ago and the road from SH 95 through Lanty to Solgohachia has been paved and the bridge there has been replaced. I wished I had photographed them before they were torn down and I wondered if the Fryer Bridge had been replaced as well. None of my family, even my step dad, seemed to know and I never seemed to have to time to go check for myself when we drove through the area. While at the Ozark Folk Center State Park in Mountain View in June 2005 I had a few minutes between activities and wanted to read something about the area’s history. I went to the administration building thinking that they sold books there and was directed to the gift shop but it was closed. Then the young receptionist found some old travel and Ozark topical magazines for me to read and there on the first page of a photo essay of historic bridges of Arkansas was a photo of the Fryer Bridge! 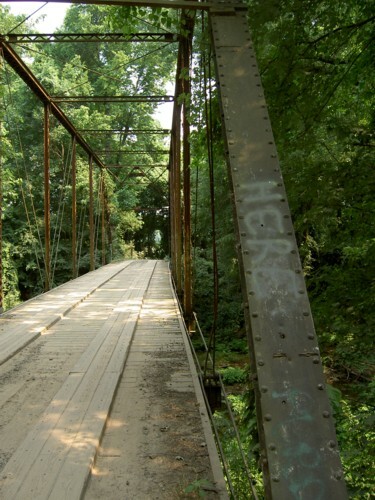 The magazine was the April 2004 issue, Volume XV, Number 12, of Active Years and the cover said “View Arkansas’ Historic Bridges BEFORE THEY VANISH.” The story and photographs were by Maxine Payne. The article gave me hope that I was not too late to get my own photographs of the bridge. Not only did my wife and I find and photograph the old bridge, but she was very impressed with the Fryer Bluff. Perhaps the following photos will do them justice. 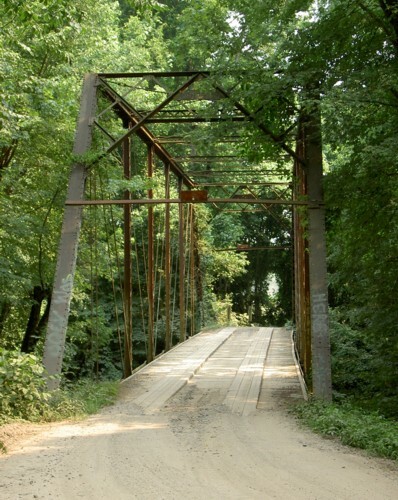 Maxine Payne says in her essay that this bridge was built in 1890 and is the oldest pin-connected Pratt through steel truss bridge still in use in Arkansas. 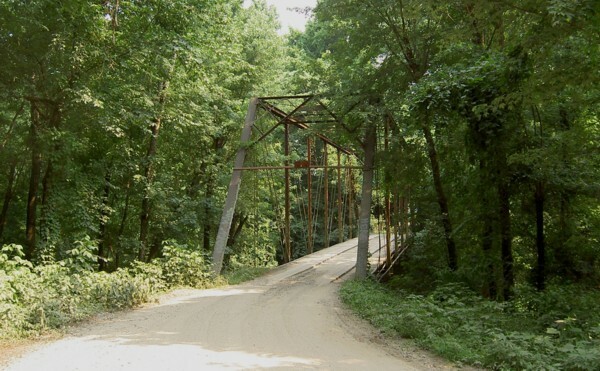 There are 16 other bridges of that type left in Arkansas. 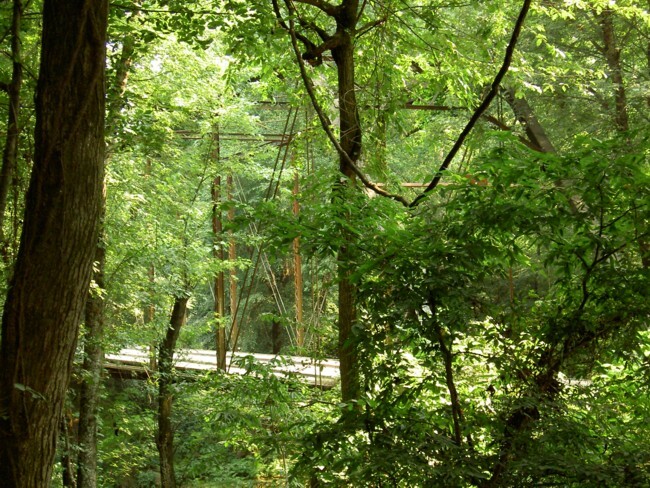 It is the only known bridge built by the Wrought Iron Bridge Company in Arkansas. The bridge is 16 feet wide and spans 126 feet. The vertical clearance is 14 feet. It may be that this little road was once the main route west from Springfield, a former county seat, to Hattieville, Old Hickory, and points west to Dover. Dover was a major commercial center back in those days. I followed the road east from SH 95 along the foot of Pigeon Roost (or Bull) Mountain around Fryer Bluff and parked just off the road here where the road meets the north bank of East Point Remove Creek. The road makes a sharp right turn onto the bridge and then continues through the low creek bottoms on the south side and then up around the hills to Solgohachia. This closer view shows more detail of the north end of the bridge. There are no signs indicating a load limit or warning to yeild for traffic approaching on the bridge. The level of the land drops a few feet on the south bank and the road curves back to the west a little. An even closer view shows the weathered condition of the metal structure. The deck and runners seem to be in good condition. Note that there is no handrail for pedestrian security. One of the vertical support bars in the first pair has been bent. Horizontal links are visible along the side of the deck. The horizontal links, the verticle links and the metal beam under the deck are linked together with a pin. This used to be a good swimming hole, but there has been little rain and there may be a dam upstream that holds all the water. The old tire was in the photograph taken by Maxine Payne the year before. The bent vertical support rod was on the inside, but has been bent until it is on the outside its mate. The horizontal rods and the pin connection are a little clearer in this view. A piece of angle iron covers the ends of the bridge deck planks. Actually this hole upstream of the bridge was probably a better swimming hole. At least it would have been deeper for those who wanted to swing from the bank and jump in. The bars on the right of the vertical support seem to be flat metal bars with slightly enlarged ends that have been punched through to form a hole like the eye of a needle. The bars on the left are circular in cross-section with turnbuckles for adjustment. A couple drove across the bridge in their pickup while we were there. Ann was very close to the edge! This is the view from the south end of the bridge. Our van is just barely visible off the road beyond the pickup. As I walked back across the bridge it began to move and squeak with my steps. This is the inside of the southeast corner column of the bridge. It looks like it's buried in the side of the road and vines are beginning to take over. 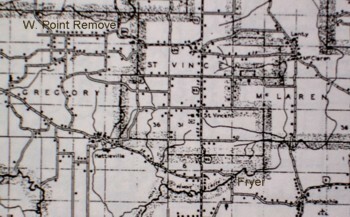 This is a portion of the Conway County Road map of 1936. Solgohachia is in the lower right corner. Fryer Bridge is near the top corner of the 'F' in Fryer. Old Hickory isn't listed but it is near the 'G' in Gregory Township on the left. Hattieville is to the southeast of Old Hickory. The new Wonderview High School was built at the top center on the north ridge of Pigeon Roost Mountain just above the 'c' in St. Vincent. 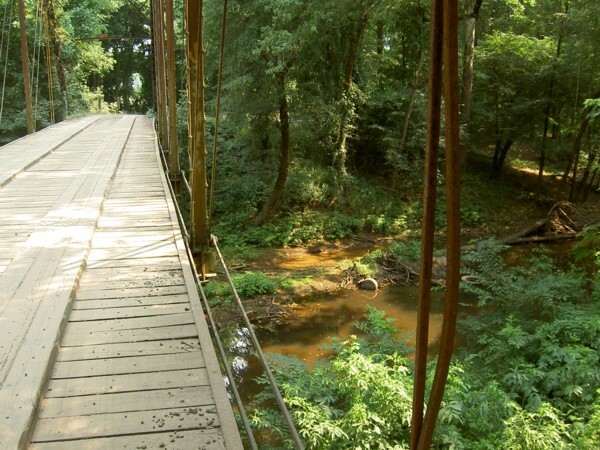 The bridge in a later photo is located where the road crosses the creek near the 'e' in W. Point Remove. Fryer Bridge - Several photos of the bridge. Fryer Bridge - LOST - These photos show were the bridge used to be and the remains of the bridge in the creek. The New Fryer Bridge - These photos show the new bridge over East Point Remove Creek at the Fryer Bluff Crossing. Fryer Bluff - Several photos of the bluff and photos of some other old bridges. Ouachita River Crossings - Photos of Ouachita River crossings from its headwaters north of Mena to Arkadelphia. Illinois Bayou Bridge - Photos of the Illinois Bayou and the one-lane bridges north of Scottsville, Arkansas. Maxine Payne-Caufield - The Web Site of the young woman who did the photo essay referenced on this page. I highly recommend the site of this 'okra' girl. 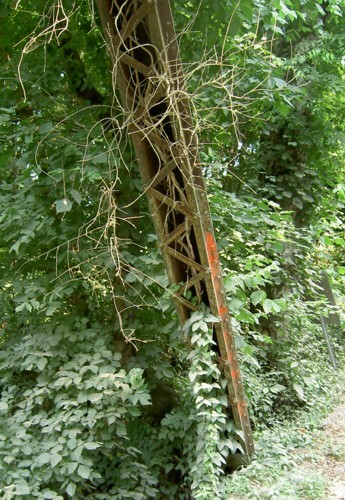 Bridge Hunter - An excellent site for data on old bridges. This is the Fryer Bridge page with 21 photos of the bridge at various seasons and includes a name plate at the top of the structure that I couldn't get to to photograph. There is a map and a big table of bridge facts with dimension and so forth. There is data on the most recent inspection. The bridge is woefully deficient.